The gift of preparedness is one of the best gifts you can give someone. Whether you are looking for presents for the Average Joe or the most prepared guy you know, we have you covered this year. So instead of getting everyone you know a fruitcake, consider the best prepper Christmas gifts in the list below. They are sorted by specific interest and then by cost in the category, so you can get the exact gift you are looking for with the right price range. Many preppers are in to the EDC concept, or keeping basic necessities close by on your person for everyday use. The items you keep with you can increase how prepared you are for many situations. Many of these tools double as great additions to bug out bags as well- another prepper staple. The best and most reliable pen available, this pen can write in extreme temperatures, upside down, and underwater. They are usually found being put to task by search and rescue teams, law enforcement, and the military. This makes a great companion gift to the Space Pen if you are looking to get or give a little more. Having a notebook that you can write on in any conditions is perfect for EDC kits. If you already carry a knife, this multi-tool can add a whole lot of functionality for it’s size and cost. There are eight tools included: needle nose pliers, regular pliers, wire cutters, scissors, flat screwdriver, tweezers, nail file, bottle opener, and carabiner. I own one and find a use for it every single day at work and at home. It is TSA compliant so you can even keep it with you on the go. A well made folder makes a great gift. This knife designed by Rick Hinderer is high quality at a low price. The assisted opening, frame lock, and multi position clip all add to the functionality. The WaterBOB is a huge bladder for storing water in before an emergency. While you need a little head’s up to use it, it holds a ridiculous amount of water given how much it costs. They are meant to be disposable, so even if you are buying one for a seasoned prepper, they will appreciate duplicates if they already own one. The Classic Bucket from Mountain House is a great food storage gift since the variety lets you try out many different Mountain House meals. It is always best to taste test before you stock up on huge amounts to be sure you like the flavor. An under appreciated facet of prepping is home security. Everyone can benefit from bumping up their level of home security, and these gifts are sure to please both preppers and people just looking to make their home a little safer. Misdirection is a great deterrent for would-be intruders. This LED light turns on at dusk and stays on for four or seven hours based on the setting. It lights up a room to look like a TV is playing, draws much less power, and is more portable. While we are big proponents of gun safes at TruePrepper, this is a great option to keep a baton, flashlight, and other self-defense equipment nearby when you are sleeping. The mattress holster has several loops so it can hold a variety of tools. Without contracts, installation, or monthly fees, the Canary can provide great home security for a low price. With an internet connection, you can securely monitor your home while away with the built in video and microphone. It has a built in siren and can contact authorities as well. If you are set up with a big contract through a security company, this gift might actually save you money. 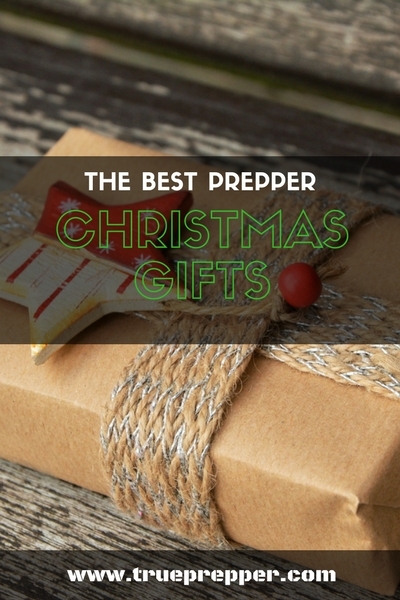 Whether it is for a specialized kit to prepare for a specific disaster or specialized gear for a bug out bag, specialized prepper gifts are a sure bet to get for the prepper that has everything. While it may seem outlandish at first, this one is pretty hard to go wrong with. All that stored toilet paper does nothing if you need to bug out and leave your residence. A travel bidet is perfect for a bug out bag, and not common on many lists. It doubles as a great gag gift or white elephant gift if you are into that sort of thing. I am not sure what kind of voodoo magic keeps printer ink on the paper and water off, but this set of 25 pages of printer paper is amazing. Use them to create custom checklists or local maps that you can pack as small as regular printer paper. Cards are always useful in survival situations to pass the time, and make a great gift as well. These cards have thought provoking tips for surviving disasters in urban areas. These make for great stocking stuffers. For the prepper who is also into bushcraft, or in need of a good knife. The full tang fixed blade Moraknivs are known to be some of the best bushcraft knives in the business, and the heavy duty one makes a great addition to bug out bags or backpacking gear. This blanket folds up amazingly small for it’s size when spread out. Normally when you remove something from a small package it is nearly impossible to get it to fit back in. Not with this blanket- it folds neatly back into the included pouch using the included instructions. If you need a unique gift for anyone, this should be a contender. 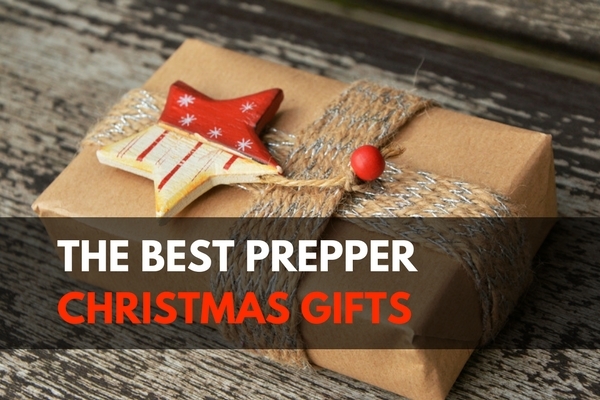 Whether you are polishing up your own list or looking for prepper Christmas gifts for a friend or loved one, hopefully you have found something that will work great. Preparedness makes a great gift, but just spending time with your loved ones is more important than gift giving. We wish you a Merry Christmas here at TruePrepper, and hope it is filled with family and joy. Keep exploring, stay prepared, and be safe. We should note that the TerraSlate 4 Mil Waterproof Printer Paper is for laser printers, not ink jet printers that are more common in most homes. The same “kind of voodoo magic [that] keeps water off” will also keep ink jet printer ink off as well. Also, the TerraSlate paper is only available in a 50-sheet package that is listed as “USED” whatever that means for $20 or a 1000-sheet crate for $524. That’s 40¢ a sheet for “used” paper or over 52¢ a sheet in the 1000-sheet package. The well known Rite In The Rain paper is also available for laser printers, at $33 for 200 sheets or $12 for 25 sheets (which is still less expensive than TerraSlate. Or if someone wants the ultimate in fully waterproof printer paper, Rite In The Rain offers their Waterproof Duracopy Laser Paper at $71.45 for 100 sheets.